I am a dedicated zerg player, and today I spent the morning watching replays. I wanted to share one that I thought stood out. To more experienced / master players, this may not be so incredible, but I thought that it was an excellent example of the way that zergs racial abilties can be exploited to win over the hardiness of protoss units and efficient macro. The whole idea of a brood lord / infestor / queen build (stabilized by zerglings), is certainly nothing new. I'd say Destiny contributed the most to popularizing how to abuse the versatility of infestors. But 창조의아침 executes something else in this replay : an unwavering, inexhaustible patience. The replay is a bit long, but I felt that the comeback at the end makes it worth it. Despite the cannon rush, endless harassment, exploding hatcheries, low minerals, tons of toss units smashing and stomping everything in sight, 창조의아침 executes a unbelievably disciplined approach. To me, this is a thing of beauty. Sicong Wang, the son of the president of WanDa, recently paid over 40,000,000 RMB (or over $6 million USD) for the gaming team CCM (Catastrophic Cruel Memories). CCM was comprised of gamers from titles such as League of Legends, Defense of the Ancients, Starcraft 2, and Warcraft 3. As a sum as large as $6 million is not often mentioned in the esports community, this is not only big news for China, but competitive gaming in general. But this purchase did not come without its share of controversy. Some are accusing Sicong Wang of causing discord within another team, LGD. One of the players, ZSMJ, has not been invited to the Invictus Gaming lineup out of 4 others, and many followers of the original team feel breakup of LGD is a tragic one, like a romance gone awry. But this establishment of Invictus is still a milestone an esports history, as China gears up to make their mark on the competitive gaming industry. When I first stepped into the convention center for MLG this past Friday, I was feeling a little drained. The overnight bus ride from Philly left me sleepy, and standing in line for two hours before we could even enter the main room didn't help. I remember waiting out there after checking in, listening to my “State of the Game” podcast. The Dr. Pepper girls came along suggestively eating bananas and handing out promotional materials. I was a little too tired to be titillated. It's not to say that there weren't highlights from my trip to Columbus. I met FXOSheth as I walking down a hallway to the food court. He gave me an autograph in silver sharpie on my SC2 box. I was so excited to meet him, and had so many things that I wanted to say, that I ended up saying nothing. Even if I acted like a goon, he was expressly cordial and I appreciated that. I also managed to get an autograph from oGsMC while the rest of the Korean guests were sitting at the front table. MC was a very respectful guy and it was a pleasure to shake his hand. As the match began on Metalopolis, there was a little skirmish at Idra's natural as MC's probe threatened to lay a pylon to block the hatch. When Idra's drone gave the probe a shove before dropping the hatch, the crowd immediately cheered. A couple of zerglings began chasing the fleeing probe across the screen, and as soon as metabolic boost kicked in and picked off the probe, the crowd went over the top with excitement. It was a little silly, because picking off a probe is far from a game-ending injury, but it didn't matter. That crowd belonged mostly to Idra. 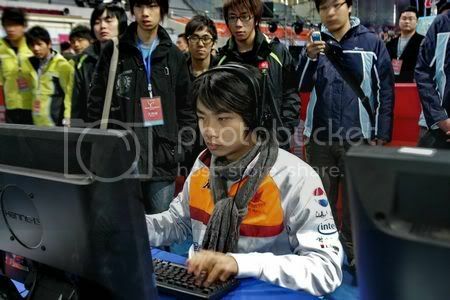 They wanted him to make an impression on MC, as not only was he a Korean player, but also a Protoss. Greg (Idra) had always been outspoken about his feelings of imbalance between his race and others. So it made the stakes even higher. All I can say was that Idra's play that day evoked feelings of awe, demonstrating the same scale of talent and refinement you'd expect from a modern Mozart. His strategy and planning were executed with the same balance and grace you see from gold metal figure skaters, whipping out the Triple Axel. I was so impressed with everything I saw that every other match I watched felt to pale in comparison. A cluster of roaches gathered beside the ledge to MC's main before a group of Overlords swooped over to pick them up, and drop them over the edge. MC caught the little maneuver and his stalkers started blasting away. Idra dropped his roaches back down as MC threw suffocating force fields, keeping the units insecurely pinned. It didn't matter. Idra roaches spat back in retaliation, and mowed down the rest of the stalker supply. Idra's management of drops and retreats reminded me of the same action Terrans execute with Metavacs: cunning, double-pronged attacks targeting fissures in the opponent's defense. When MC's “gg” was posted on the screen, the crowd lost it, bursting at the seams with enthusiasm. Nothing could compare with the passion I saw from the people seated there at that moment. A chant of “USA! USA!” started to erupt from some of them, and I was a little bewildered by the nationalistic sentiment. After all, the Koreans were our guests, and we all were excited to have them there. It was as though the crowd was creating a new rationalization as to why they had sided with Idra. I thought it was because he was supposed to be the underdog. But this kid from Jersey was giving Korea's top Protoss player a run for his money, even if MC came from a culture of integrity, exuding tireless discipline and constant practice. It's interesting, because when I listen to the casters discuss Korea's relationship to the rest of the competitive gaming world, they seem to refer to anyone of non-Korean national origin as “foreigners.” In the case of MLG, I thought the Koreans should have been referred to as “the foreigners,” as they were our guests in the US. But because Korea has established itself as the premier gaming nation, we seem forced to think of ourselves and everyone else in second-tier terms. When the second game ensued on Xel Naga Caverns, MC tried something a little more sneaky. He rallied a handful of zealots to a bottom map position where the scouting drone wouldn't see them. He then ran them up to Idra's natural and started hacking away at the hatch. To respond, Idra sent his queen over to batter the attack off. This is where something interesting happened. MC decided to take some of his zealots off to deal with the queen, instead of flattening the hatch, which I believe he could have achieved. It made me wonder if MC wasn't struggling with some kind of self-defeating psychology at that moment, as the conflict and resolution didn't seem to make sense to me. Later on in the match, MC had an army of stalkers and sentries gathered to Idra's natural. Some kids seated next to me cried out, “Target the hatch! Target the hatch!” Which again MC chose not to do. Destroying that hatch would have crippled Idra's economy, and his choice to engage the roach army instead still confuses me. In conclusion, that first series on Friday between Idra and MC will be something I will always remember. That day, Idra set the benchmark for the way I feel that zerg play should be executed, and left a remarkable example for us as players to strive for. I understand that there were some disappointing events in the days to come at MLG, but that's not what this post is about. I was bummed that I had to leave early on Saturday afternoon, and I was bummed I didn't get a chance to get Idra's autograph, or meet Day9. 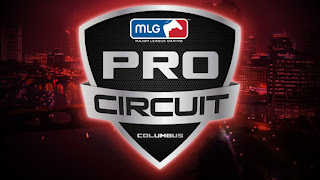 But there are new events to look forward to on the e-sports horizon, so I suppose I'll take the best from the experiences I had at Columbus, and look to the future. While China's Ministry of Commerce just approved Starcraft 2 in February of this year, already there is talk that the Chinese players could rise to dominate the competitive landscape, surpassing even Korea in prominence. The Starcraft community is looking on with bewilderment as the top ranking players on sc2ranks.com are all from the Chinese ladder. What gives? Some say that looking at ladder points across realms provide a distorted perspective. The Chinese players are only competing against other Chinese players, which or may not have had early access to the game. Others insist that despite the handicap of a late release, the Chinese players win rates are still impressive. People who are a little more familiar with the competitive gaming scene in China recognize some of the players as Warcraft 3 pros, such as xiaOt and Infi. While some say it is improbable that China will exceed Korea as the premier competitive gaming nation, one still must consider their strong work ethic and massive population pool. Until we have a chance to see these players compete, all we have to go on now is speculation. For some insight into the pro-gaming scene in China, this article provides some interesting detail. Not only does it discuss some of the struggles faced by pro-gamers such as Li Xiaofeng (李晓峰), it also discusses the challenges surrounding e-sports as it attempts to distinguish itself from other online vices that have made a poor impression on the Chinese. Though there is some apprehension surrounding online gaming, there is still an acknowledgement of the huge commercial potential surrounding e-sports, and the possibility that it could be a positive intellectual engagement for the youth. After digesting this discussion, it leaves the question: what can be done to change negative perceptions surrounding e-sports in China? This blog will attempt to investigate this subject matter and share observations as they become available. This blog will also provide weekly posts highlighting the greatest gamers of the Middle Kingdom!